You are invited to exhibit your product or service during our NHS Change Day event on Wednesday 19th October 2016in a busy outpatient area on our hospital site. You will have access to clincial staff and patients, who will be attending the exhibition areas throughout the day, to promote and demonstrate your innovation. What is NHS Change Day? Everyone and anyone can choose to make the NHS, primary care and social care better. 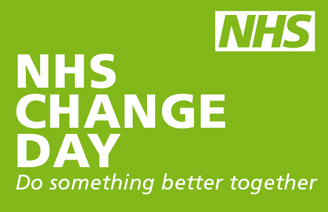 NHS Change Day is a grassroots movement that asks anyone who engages with the NHS to make a change for the better, and then to share what they have done to inspire others. NHS Change Day is our opportunity to come together to harness our collective energy, creativity and ideas to make change. Together each of our small actions will make a big difference in improving the care and wellbeing of those who use health and social care services. This event will encourage shared learning across the Trust. The goal is to enable individuals to network and have greater access to on-going projects and lessons learnt throughout all our clinical areas. We will be showcasing change projects aligned to the themes stated above. Expressions of interest from companies that wish to attend should be made via email by clicking the link below. Please include a brief description of your innovation and how it aligns with the themes. A financial contribution of £250is applicable to help cover event costs. The deadline for expressions of interest is Thursday 22nd September.